Cardinal Health Essentials Chair Pad with Moderate Absorbency is a soft pad that is ideal for those who require minimal moisture absorbency, such as excessive sweating and pressure sores. 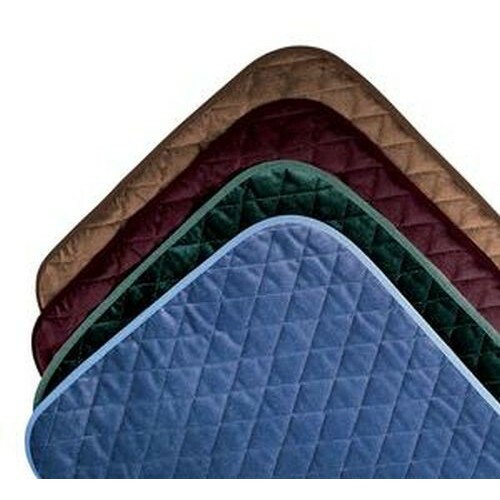 Its absorbency level is similar to the CareFor Deluxe Washable Underpads and can be used on any chair or in bed. It is made from an ultra soft material and provides comfort and security to those who experience urine leakage. 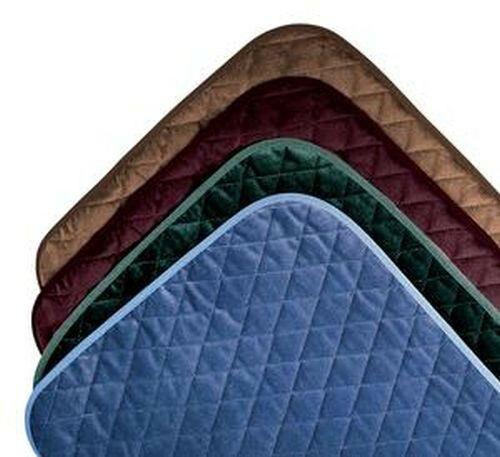 They are reusable and machine washable, which makes them a perfect pad for occasions that may result in little mistakes. It protects your furniture from damage and keeps it clean. It measures 21 x 22 inch and is available in 4 colors; blue, green, mauve, and tan. They fit chair seats perfectly, are comfortable, and don't leak. They are no-fuss in the laundry, don't keep residual odor, and hold up great. This was a second order for me and I'll order more to replace other brands I have. Love them! These look nice and the quality seems good but I'll caution against using them to manage pet or people urine.. Liquid just beads up and rolls right off -- they are not absorbent AT ALL. The urine will literally sit on top of it until you wipe it away, which might be fine for some, but ended up being a waste of money for me.. Even better than I expected. Bargain price for this brand. Soft, comfortable material. Fits well and stays put. Looks good. Just using it to protect the recliner seat from spilled food and regular wear and tear. Washes well. It retains its shape and color and doesn't get wrinkled. Though the underside is waterproof, it doesn't feel funny or make noise when you sit on it. Great product. Prompt shipping. Thanks, Vitality Medical! these pads may be soft but they liquid just rolls off and you have urine on the floor....NOT SANITARY! Nice product and super fast shipping. My DH is not yet incontinent but sits for long periods of time and developed pressure sores on his buttocks. I tried 4 different pads and this IS by far, the softest of all of them! I have reordered and now have plenty on hand, for a fraction of the cost of the others. I didn't need greater absorbency, so this is perfect for us. I have multiple cats that want to sleep on my dinette chairs. I use these pads on top of the cushions and I can sit down without fur or other less desirable spots on my chairs. If they make a mess, it is not absorbed and I can rinse it off and drop it into the washer for easy cleaning. I didn't need this for protection, I needed it as a cushion for my DH. Soft soft soft! I ordered these pads to use in my wheelchair. I am paraplegic and have started having a problem with urine leakage. I don't have a lot of sensation below my chest, so I don't always know when I have leaked. These pads protect my wheelchair cushion without shouting "incontinent!" They simply look like a nice cushion cover. They wash and dry nicely, and I bought the ones that were on sale, so I feel like I got a great deal on something that serves me well. Thanks, Vitality Medical.